A computer-generated image of the future Gowind 2500 corvette designed for the Royal Malaysian Navy by DCNS and Malaysian shipbuilder Boustead National Shipyards. PARIS --- France’s DCNS shipyards group has for the first time officially confirmed the sale of 10 Gowind corvettes to Egypt and Malaysia, together worth about 1.5 billion euros, and which have vindicated the company’s investment in this new class of warships. Further sales are anticipated. The Gowind design is derived from L’Adroit, an innovative ship combining certain attributes of frigates and offshore patrol vessels that DCNS developed on its own funds to meet what it believed was a market niche offering significant growth potential and a lack of credible competition. Gowinds are small frigates or large corvettes, rather than offshore patrol vessels, which have small crews and are economical to operate, says a company official, although they can carry a full complement of sensors as well as air-defense and anti-ship missiles and torpedoes. “This is a growing market,” he says, and a number of countries are preparing to launch tenders for such ships, the first of which is Kuwait. 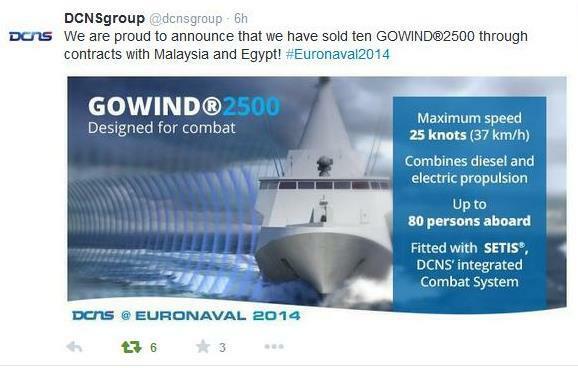 The sale of six Gowinds to Malaysia and four to Egypt has been previously reported, notably by the Paris-based LaTribune.fr website, but were only officially confirmed by DCNS during last week’s Euronaval show in Paris-Le Bourget, and even then only by a post on its Tweeter account. DCNS’ Malaysian contract involves the sale of the Gowind 2500 design and related technology to a local shipyard, Boustead Naval Shipyards (BNS), which is the prime contractor and will build all six ships at its Lumut shipyard under the Malaysian navy’s Second Generation Patrol Vessel (SGPV) program. BNS was awarded the $2.8 billion contract in 2011, but it only went into effect on July 14, 2014 after completion of a major upgrade of the Lumut shipyard. DCNS’ involvement began in 2012, when it signed a Letter Of Agreement with BSN, and in addition to the design and related technology, it will also supply the ships’ combat management systems and technical assistance in adapting the basic design to Malaysian requirements, which for example call for a slightly longer ship (+ 8 meters), powered by four 16-cylinder MTU marine diesels. Under the contract, DCNS retains IP rights to the basic Gowind design, whereas BNS will own the rights to the Malaysian variant. The Malaysian contract is worth “several hundreds of million euros” to DCNS, according to company officials; construction of the lead ship is to start in March and its delivery is tentatively planned for 2019, substantially later than initially planned by Malaysia. The French company also plans to compete for a possible follow-on third-generation program if that project goes through. The second Gowind 2500 sale is to Egypt, and is the first time that country has procured French naval ships. 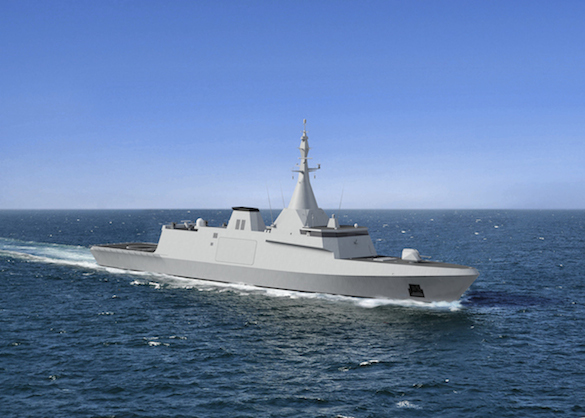 The order was negotiated very quickly, and as the Egyptian navy has an urgent need for the vessels the lead ship will be built by DCNS in France while Egypt modernizes the military shipyard which will build the following three ships, with technical transfer and assistance provided by DCNS. At 102 meters, the Egyptian Gowinds are slightly shorter than Malaysia’s, and since they will also be used for mine countermeasures, they will have a hybrid power plant combining electric motors and two 20-cylinder MTU diesels. The French-built ship is due to be launched in 2017, and the upgrade of the Egyptian shipyard began in July, at the same time as the procurement contract, worth a little less than 1 billion euros, was signed. It also includes options on additional ships. Separately, MBDA is negotiating a contract to equip the ships with MICA Vertical Launch air-defense missiles and MM-40 Exocet anti-ship missiles, together worth an additional 400 million euros, while DCNS is negotiating a 100-200 million euro contract for torpedoes. Having been able to benefit from the French Navy’s “imprimatur” through the innovative, three-year no-cost lease contract, DCNS has been able to refine the Gowind design and now offers several competitive advantages on which it bases its confident outlook for the design’s sales prospects. One is that Gowind is a new design, incorporating innovations such as a bridge with 360-degree visibility, two separate rear loading ramps for fast boats, and a degree of adaptability that company officials say is unmatched. An example is the ship’s main mast, which is both a separate sub-assembly and entirely modular; in other words, it can be fitted with all customer-specified sensors, and all are wired through the mast’s interface with the superstructure, which also simplifies future upgrades. Mast-mounted sensors benefit from full, 360-degree visibility, and have no blind spots. The mast’s customization can go even further, and DCNS can adapt the composite material in which it is made to ensure it does not interfere with radar or other emitters. “All this translates into an operational advantage that marks the difference in our ships, especially as our competitors offer much older and less flexible designs,” says a company official. -- 04 Nov 2014: Added author's byline.